Korean braised dishes are so easy to cook in the slow cooker, and this spicy braised pork rib (maeun dweji galbijjim) is no exception! You throw the ingredients in the slow cooker and forget about it until the meat is fork tender and ready to be served. 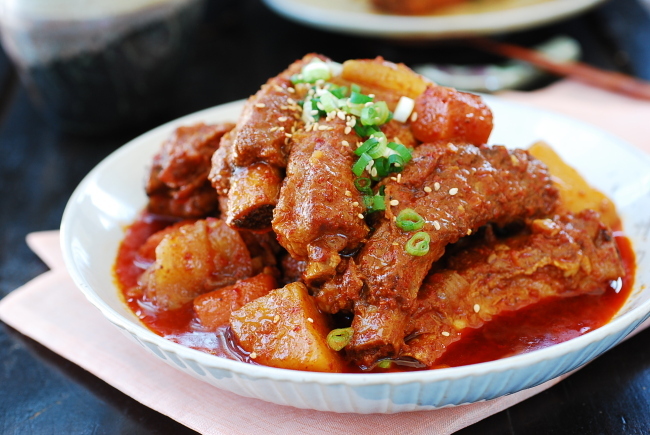 Maeun galbijjim (spicy braised ribs) is a popular braised dish in Korea. I like to use baby back ribs for this recipe. They are tender and meaty. This recipe is spicy, but you can certainly make it spicier by adding more gochugaru (Korean red chili pepper flakes), some dried whole red chili peppers, or fresh chili peppers. On the other hand, if you want to make a mild version of the braised pork ribs, you can reduce or omit gochugaru. You can sear the ribs to add that rich browned meat flavor and remove some fat if you like. This recipe skips that process. Separate the ribs by cutting through the meat between the bones. Rinse the ribs, and let them sit in cold water for about 30 minutes to draw out excess blood. Drain well or pat dry with paper towels. Meanwhile, prepare the vegetables. Place the ribs in the slow cooker. Mix all the sauce ingredients (except the sesame oil and seeds) in a small bowl. Add to the ribs, and stir well to coat evenly. Drop the vegetables in. Turn the slow cooker on high heat. Cover, and cook for about 3 to 4 hours until the ribs reach the desired tenderness (you can cook on low heat if you’ll be out longer, about 6 to 8 hours). Stir in sesame oil and sesame seeds. Skim off excess fat before serving, if desired. Serve with a bowl of rice.